Update: Kenwood has shared via press release that Google is actually working to bring wireless Android Auto to select Android Oreo devices. This is good news if your phone wasn't one of the phone confirmed to receive the P beta. Which phones will it support? Google hasn't yet shared, but keep a lookout for more information soon. Android Auto, the in-car option for using smartphone apps on your dashboard, began supporting wireless connectivity last month, allowing owners of any Google Pixel or Nexus device to connect their smartphones to their car without a cable. But for non-Google devices running on Android, you'll eventually be able to use Android Auto wirelessly—so long as your device has Android P installed. Detailed during at Google IO 2018’s day 1 keynote, Android 9.0 will use AI-based software to improve phones’ battery life and security. 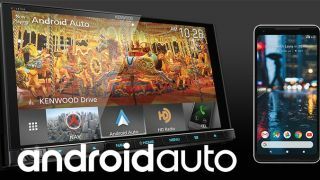 And, based on a press release from Kenwood, Android P will also allow Google to make third-party devices Android Auto-compatible. The press release specifically noted that Google devices running Android 8.0 Oreo or higher can access wireless Android Auto, but that any non Pixel or Nexus phone will require 9.0 or higher. So, any users stuck with Oreo or Nougat on their current devices will have to either buy the cable or upgrade to Android P.
Can you run Auto wirelessly? Google has already announced which phone families can download the Android P beta today, which gives us a list of which phones will (eventually) get wireless Android Auto support. Beyond the Google Pixel, Google Pixel XL, Google Pixel 2, Google Pixel 2 XL and Nexus phones running Android 8 or higher—remember, these don’t need Android P to use Android Auto wireless anyway—owners of the Essential Phone, Nokia 7 Plus, Sony Xperia XZ2, Xiaomi Mi Mix 2S, Vivo X21 or Oppo R15 Pro can download Android P beta right now. Plus, future Android devices, like the OnePlus 6 releasing later this month, will undoubtedly support 9.0 as well. But, if you have a slightly older model phone, don’t count on it. Remember, none of these devices host wireless Android Auto functionality yet. They simply have the potential to host it now. But we do know that Google is currently working on expanding Android Auto's reach. Google has a support page that lists all of the current devices that can run Android Auto wirelessly, and it will be updated with new devices over time. If you own one of the devices above, feel free to bookmark it and check periodically to see when Google has gotten around to third-party support. And if you own an iPhone? Don’t hold your breath; try out Apple CarPlay instead.